Bossy Boots and Sensible Shoes are footwear for a number of popular figures. Distribution of most of these models is by email only (see here for details); Headkase pulled them from ShareCG because they were being re-sold on Second Life. This wiki's first administrator has a full set of the files. Sensible Shoes, single pair in front and first row original textures, second and third row Chic for Sensible Shoes by Headkase textures. Headkase gave permission to convert Sensible Shoes and Bossy Boots to other figures. These conversions require textures, either from the Victoria 4 set or an add-on set. 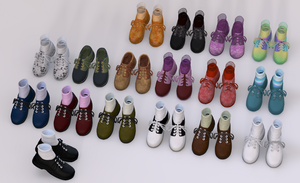 Sensible Shoes for Genesis, made by Varsel, is still available on ShareCG. 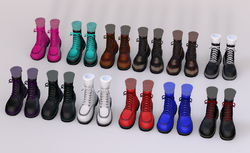 Bossy Boots and Sensible Shoes for Kids 4, made by Bee, is also still available on ShareCG. Bossy Boots and Sensible Shoes for Krystal Starfox, converted by Little Dragon, are available on Krystal Starfox's homepage. This page was last edited on 4 August 2018, at 12:39.